The fundamental economic narrative propelled US equities higher in 3Q18. Highlighted by strong earnings, late cycle stimulus, elevated consumer and business confidence, low unemployment and improving wage growth, the S&P 500 posted its biggest quarterly gain in five years. At the end of September, the Bureau of Economic Analysis released their final revision of 2Q18 real gross domestic product (GDP), an inflation-adjusted measure of the value of all goods and services produced by an economy. The updated report shows U.S. economic growth of 4.2% in the second quarter, exceeding last year’s growth for the same quarter. Improved performance has been largely attributed to the benefits of tax reform. Consumer spending grew 3.9% in the second quarter. Representing the largest component of GDP (68% in 2Q18), improved consumer spending has a direct impact on economic growth. The U.S. added 201,000 jobs in August, exceeding forecasts of 192,000 while the unemployment rate remained low at 3.9%. Supporting consumer spending, average hourly earnings in August increased 2.9% from a year ago, marking the fastest wage growth since mid-2009. Business fixed investment, bolstered by tax reform, is poised to contribute meaningfully to future growth. In an environment of strong corporate profits and a tax code favorable to capital spending, investment should pick up as soon as trade policy ambiguities, such as tariffs with China and renegotiation of NAFTA, are addressed. The Federal Reserve recently raised the federal funds rate by 0.25% to a range of 2.00% to 2.25%, the eighth such increase since December 2015. Notably absent in their statement after the September meeting was the term describing the Fed’s monetary policy stance as “accommodative”, suggesting officials are considering a more aggressive outlook towards rate hikes. Against a backdrop of solid corporate earnings and stable economic growth, U.S. stocks performed strongly in the third quarter. The S&P 500 gained 7.2% in the third quarter, while the Dow Jones Industrial Average gained 9%. The Nasdaq Composite climbed 7.1%. All three indexes are within nearly 1% of all-time highs. The tax overhaul passed last year, which cut the corporate tax rate to 21% from 35%, sent corporate profits skyrocketing in the first half of the year, and analysts expect third-quarter results (yet to be announced) to continue that trend. The healthcare sector outperformed in the third quarter with a gain of 14%, surpassing the technology sector, which slowed in September. In the wake of Facebook’s data breach and increased media scrutiny, some investors reduced their exposure to the large tech companies responsible for much of the stock rally this year. 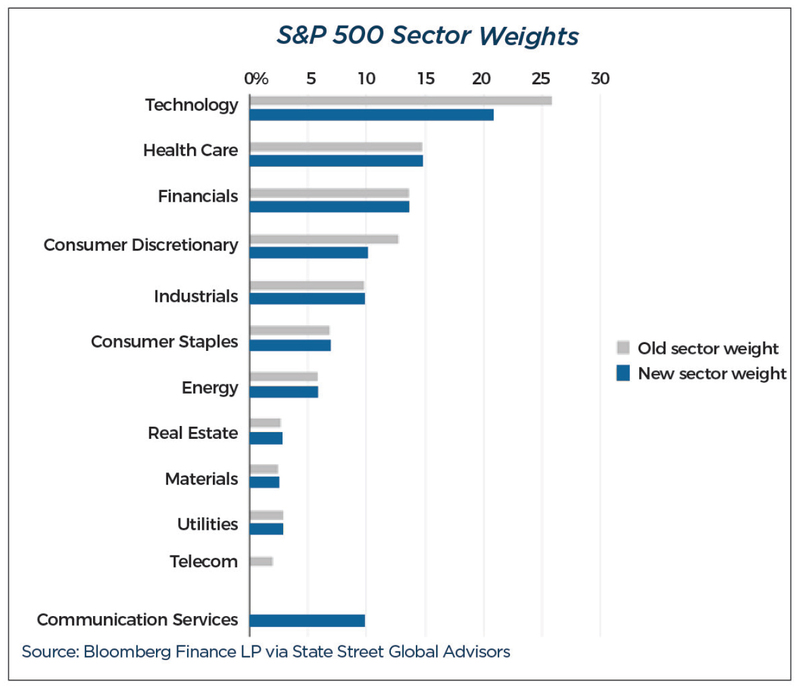 The third quarter also witnessed the reconstitution of the S&P 500 Telecommunications sector into a new sector named Communication Services. Twenty-three companies, including major index constituents like Facebook, Twitter, and Google, valued at a combined $2.7 trillion were reclassified on September 21, prompting roughly $20 billion in trading as exchange-traded funds align with the reshuffled indexes. International markets have lagged U.S. markets as growth has cooled in the eurozone and emerging markets. Prospects of a trade war between the U.S. and its major trading partners produced anxiety among investors and caused some to question their exposure to international stocks. While recent weeks have seen improvements in regards to Europe and NAFTA, concerns persist in trade negotiations with China. The U.S. dollar has strengthened relative to foreign currencies and has contributed to relative underperformance of emerging markets. International Monetary Fund (IMF) Director Christine Lagarde recently issued a warning that emerging markets could experience fund outflows if stresses effecting Turkey and Argentina spread beyond their borders. Based on these dynamics, investors have been willing to forgo increasing exposure to international markets in favor of a home country bias, as the U.S. appears to be leading the world in terms of economic and corporate earnings growth. U.S. economic growth, a tight labor market, and firming inflation create an environment conducive to the Federal Reserve pursuing monetary policy normalization. The Fed has two primary tools to achieve this goal: decreasing its balance sheet and raising short-term interest rates. These mechanisms are expected to lift yields, depressing bond prices (bond yields and price are inversely related, and an increase in one pushes down the other). The yield on the 10-year Treasury note ended the quarter at 3.055%, which marks its fifth consecutive quarterly increase. Investors flocked towards the relative safety of Treasury bonds in the face of political tensions in Europe, preventing Treasury yields from climbing even higher. Fixed income returns for the quarter were nearly flat and remain negative year-to-date. Looking ahead, duration management will be critical as fixed income investors navigate a challenging dynamic of rising interest rates with a historically low yield environment. Actual economic activity, as measured by real GDP growth, during this expansion has been the slowest of the five post WWII expansions. This more moderate pace may be the catalyst that extends the current trend beyond next summer becoming the longest in post WWII history (1991-2001 period currently holds that distinction). As always, we will be assessing the economic landscape and market data as it becomes available.